This is a bit of a no duh, as red is the color of blood, but we can’t help thinking Scarlet has a nice ring to it. And wasn’t one of the greatest heroines of all time Scarlett O’Hara…? So, why not? It means “moon” in Italian and Spanish. This name would be a tribute to Jacob, given that Bella chose Edward in the end, serving as a nice peace offering to the jilted one-time love. The name Violet pays homage to the meadow where Edward proposes to Bella. She describes it as the most beautiful place on Earth, plush with wildflowers, including violets. The meadow is not only a symbol of their love, but a symbol of growth, beauty and vitality, just like their daughter. 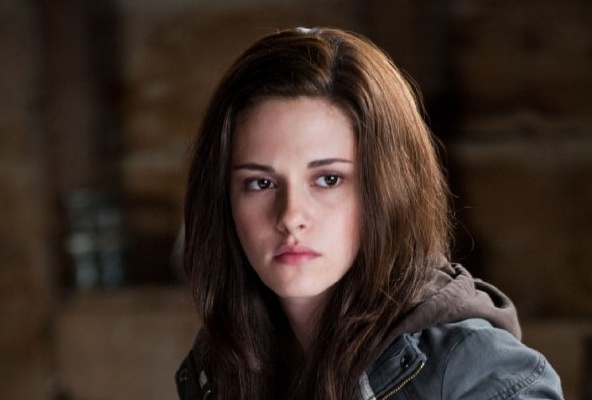 In each of the Twilight books, Bella reads a different classic novel. In Breaking Dawn, she reads A Midsummer’s Night’s Dream, the story of two young lovers who elope in the forest. Hermia pays homage to Bella and Edward’s everlasting love. In the first Twilight book, Bella reads Pride and Prejudice. Elizabeth would pay homage to Elizabeth Bennet, the hero of this book, a woman torn between two men. Not only does Bella read Romeo and Juliet throughout the course of New Moon, but Juliet is the name of the heroine in the Shakespearean play about star crossed lovers. She takes her life to pay the ultimate price for love. Earla is a name which symbolizes immense inner strength. In old English it means “noblewoman, princess, warrior and countess.” Being half-human and half-vampire, Bella and Edward’s daughter is destined to be extremely powerful, yet very fragile. Swan is Bella’s maiden name before she becomes Edward’s wife and a true “Cullen.” This name would pay homage to the girl that Bella leaves behind to start her new life with Edward. In Italian, Bella means “God’s promise.” Liesl, which also means “God’s promise,” pays homage to Bella as a symbol of hope, love and life. Meaning “lion,” Ariel pays homage to lines of a poem Bella and Edward receite to each other while falling in love. “And so the lion fell in love with the lamb.” A lamb is symbolic of Bella’s character – very weak, fragile and constantly in need of protection. The lion symbolizes Edward’s strength and his ability to always protect her.